A Tangle of Knots by Lisa Graff. Grades 4-6. Philomel, February 2013. 240 pages. Reviewed from ARC provided by publisher. In a world where many people have a Talent, a magical ability to do something really well, the orphan Cady has an extraordinary ability to bake cakes. She bakes a special cake, the perfect cake, for each child who is adopted from the orphanage (something that happens quite often since Miss Mallory has a Talent for matching children to adoptive parents). And Cady waits for her own perfect match, for her own Adoption Day when perhaps she'll bake a cake just for herself. But life is rarely straightforward and Fate has much in store for Cady. This is a deliciously magical story told in alternating viewpoints by a whole cast of characters. The quickly alternating viewpoints will keep readers turning the pages as they figure out how all the characters are related to each other. Their stories are interwoven like, well, a tangle of knots, and everything comes together with a very satisfying conclusion. Young readers will dig the quirky cast of characters, very different from each other and yet inextricably linked. Some are Talented, some are not. Some have secrets to hide, while others are trying desperately to figure out where they belong. There's someone for everyone to identify with here, but readers will surely be rooting for young Cady to find her way. She's full of heart, most often thinking of others, wondering what kind of cake would be perfect for them. 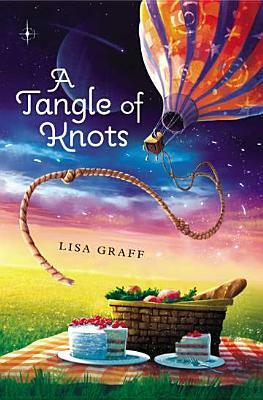 A Tangle of Knots is Savvy meets Pie with a hint of Greetings from Nowhere, and if you love any of those books I just named, make sure to grab Lisa Graff's latest when it hits shelves! A Tangle of Knots will be on shelves February 12 (just in time to buy it for a kid you love! ).